English muffins are often recommended on diet plans as an alternative to bread. English muffins are leavened with yeast and usually dusted with cornmeal. They are most often round, relatively flat and split in half for toasting. Certain types of English muffins are healthier than others, but all can be a healthy addition to any diet plan. English muffins come in many different varieties, including plain, sourdough, cinnamon raisin, granola, mixed-grain, whole-wheat and light versions. English muffins made with refined white flour do not count as a whole-grain and feature just 2 grams of fiber per serving. Most of these refined English muffins are enriched with extra B vitamins and iron, so they contain 2.3 milligrams of niacin, 54 micrograms of folate and 2.3 milligrams of iron. Unenriched muffins provide just .9 milligrams of niacin, 21 micrograms of folate and .5 milligrams of iron. Any type of English muffin can be a healthy addition to a diet plan because it provides portion control. One muffin contains between 120 and 150 calories, depending on the brand and type. English muffins offer just 1g of fat and between 4 and 6 grams of protein. One English muffin counts as two servings of grains according to the USDA Food Guide Pyramid. 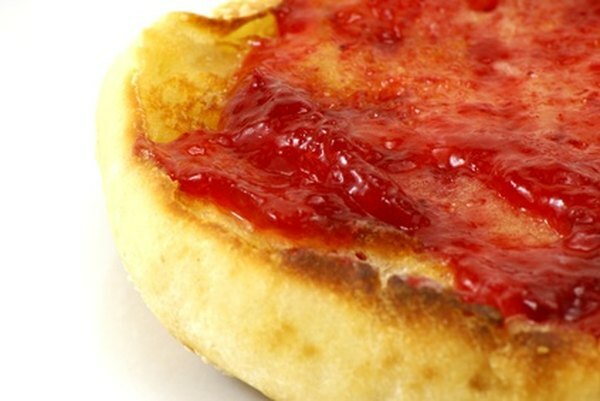 If you top your English muffin with generous amounts of butter and jam, however, you greatly increase its calorie and fat count and may negate its healthy aspects. An English muffin made with 100 percent whole grains, such as whole wheat flour, provides healthy fiber and nutrients. The USDA recommends you consume at least three, 1-ounce servings of whole grains daily -- a whole-wheat English muffin provides two of these servings. You get 4 grams of fiber in a whole wheat muffin -- the Institute of Medicine recommends most adult women consume 25 grams of fiber daily and men 38 grams. Adequate fiber intake helps food move efficiently through your digestive tract and can help lower cholesterol. Whole-wheat muffins naturally provide 2.3 milligrams of niacin, 1.6 milligrams of iron and 6 grams of protein. Opt for whole wheat or whole grain English muffins as often as possible. You can top one with peanut or almond butter and sliced banana for a healthy breakfast or snack. Top a split English muffin with low-sodium tomato sauce and part-skim mozzarella for a healthy pizza. Use English muffins for hearty sandwiches made with deli ham or turkey, low-fat cheese and avocado slices. English muffins may serve as a healthy stand-in for refined white buns for lean turkey or beef burgers as they generally contain fewer calories and more texture.